It would be fair to say that we all have our list of priorities when it comes to renovating our property. We’ll each have different ones, although the usual issues are usually high up on the agenda – the solid wood doors, the granite worktops and all of the other so-called luxuries. Something which is usually swept straight to the bottom of the list is window treatments. In fact, it’s not usually included on our budget list at all. If we have any spare cents left in the budget, we’ll dedicate it to a set of curtains – but that’s as far as most of us go. From an investment perspective, we’re going to tell you to change this approach. Our advice is simple; start prioritizing your window treatments, and watch the decision pay back dividends for years to come. Anyone can purchase a cheap set of blinds or curtains – and this is what most of us do. However, if you actually start to think about the benefits that these treatments bring, it’s only then when you can start to legislate leaving a respectable portion of your renovation budget to your windows. Firstly, it’s been found that blinds can shed hundreds of dollars every year from an energy bill. Admittedly, these aren’t any old blinds, you’ll need to shop for some sort of sun-defying option like the solar or insulated shade to reap the true benefits. As the names suggest, these can either block out most powerful solar rays, or just insulate a room and prevent heat escaping. Ultimately, you can save tremendous amounts of money from both your heating and air conditioning bills. One of the above options isn’t just a godsend from an energy efficiency perspective though; it can also save money through your general lighting costs. For example, if your home currently has a standard set of blinds or curtains installed, you’ll usually be left with the option of blanketing the room in darkness as you bid to control the temperature, or relying on the natural light but losing your thermal efficiency. Suffice to say, with a solar shade, this doesn’t occur. It still allows natural light to flow into the room, but blocks the powerful rays. A best of both worlds solution if there ever was one. If you start to believe in the above benefits of window treatments, you’ll probably start to research some of the even more advanced solutions such as motorized blinds. These aren’t fancy options only reserved for the rich and famous – they are ideal for the Average Joe who wants to see his window blinds make a difference to his monthly outgoings. By using a programmable timer, it’s possible to take advantage of the optimum sunlight levels through the course of the day and manage your home’s temperature accordingly. 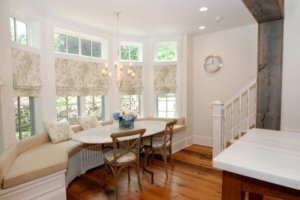 If you can combine this with another one of the advanced solutions that was discussed previously, you’ve probably just made the ultimate investment decision in your window treatments. How about dedicating a bit more of your budget to them, now?